Three months of Bible readings based in the books of Exodus, Matthew and Acts. This works well for us (Mum, Dad, 11 yr old boy and 8 yr old boy) - we use it after our main meal of the day. I say 'it works well' - the boys aren't always enthusiastic to read the Bible, but 'this is what we do as a family', and it takes less than 10 mins! We sometimes do the activities at the start, but sometimes simply adapt them into a discussion. The Bible study is good - makes us all think about the reading. And it is good to apply that to our lives too. We then have our prayer time at the end. 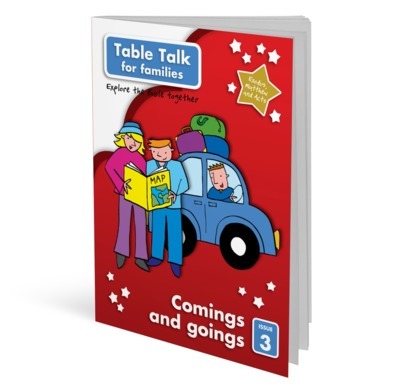 Although this is book 3, we've actually used 7 other 'Table Talk' over the passed few years, and it is by far the best resource we've found for our family devotions.